For those who follow me closely (or have nothing better to do) may remember that last year I created the 2012 AFL Trade Directory. After a pretty positive response, I decided to return the idea and create another one for the 2013 trade period. With some much improved design skills (I’ve still got a long way to go) I map out every single trade and free agent movement over the past 3 weeks. What really captures me with this graphic, is that shows the complexity of every trade deal, and all the carefully thought-out deals into one simple equation: the Ins and Outs. But also because it manages to represent how all clubs are interconnected with each other, one way or another. Hopefully you don’t get too lost, and please let me know who you think came up on top! 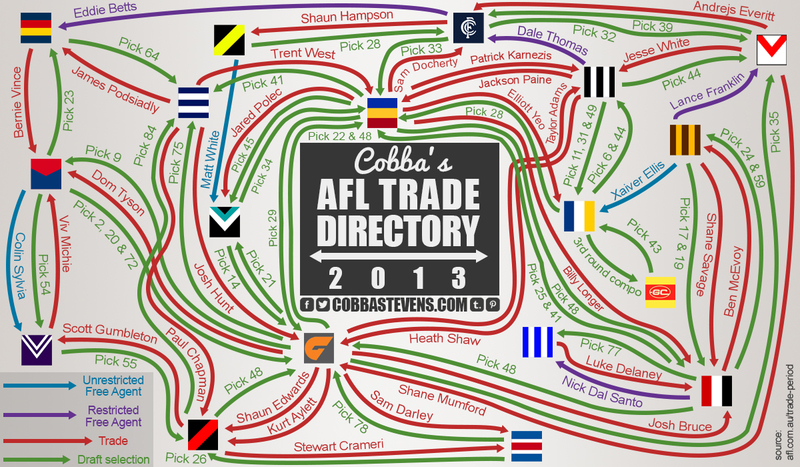 Here it is, the 2013 AFL Trade Directory!